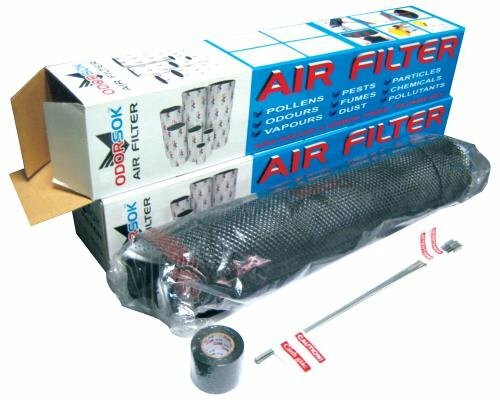 Odor-sok air filters are constructed using bundles of microscopic activated carbon filaments and fibers. By controlling fiber width to 20 nm, the adsorption rate of carbon cloth is similar to that of a single exposed carbon particle. Air flows evenly across the carbon and with accelerated absorption and increased surface area, odor-sok air filters retain all the properties of traditional canister filters. Faster adsorption rates means smaller filter equipment and up to thirty times less carbon in use for the same result over a one year period. Extremely cost effective and machine washable. Lightweight, durable construction. Easy to disposepresses to almost nothing. Suitable up to 99% humidity. If you have any questions about this product by Odor-Sok Air Filters, contact us by completing and submitting the form below. If you are looking for a specif part number, please include it with your message.